The France Los Angeles Exchange has invited artists to screen their work alongside films by other artists with whom they find a resonance or kinship. The golden age of the drive-in movie theater dates back to the 1950s and ’60s, coinciding with the rise of youth culture and the dominance of the American automobile industry. After a slump in the ’70s and ’80s resulting from the energy crisis and the growth of home entertainment, a new breed of DIY drive-in emerged in the late ’90s, made possible by affordable projection technologies and the availability of unused urban spaces. Instead of the blockbusters of previous eras, these were ideal venues for experimental and independent films. 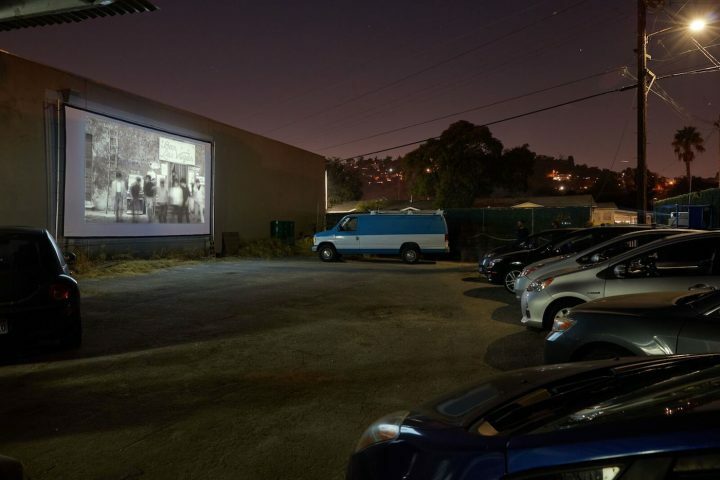 For the next two months, the nomadic FLAX (France Los Angeles Exchange) will continue its own drive-in theater program, located in the parking lot of artist-run space Tin Flats. Each Monday and Tuesday evening, FLAX has invited an artist to screen a work of theirs, and to choose a film by another artist that they find a resonance or kinship with. Next week’s screening features Alias (2018) by Sarah Rara, a meditation on distortion and solar energy, alongside One Day Pina Asked…, Chantal Akerman’s 1989 documentary about legendary choreographer Pina Bausch. Upcoming films include Alison O’Daniel’s fragmented narrative dealing with her own hearing loss, The Tuba Thieves (2018), paired with Charles Atlas’s fictional day-in-the-life of British dancer Michael Clark, Hail the New Puritan (1985–86); Clément Cogitore’s stock footage montage, The Evil Eye (2018) with Paul Morrissey’s art-camp classic Trash (1970); and Alain Resnais’s seminal French new wave film, Hiroshima mon amour (1959), which explores the legacy of the bombing of Hiroshima through a conversation between a French actress and a Japanese architect, with Silvia Kolboswki’s After Hiroshima mon amour (2008), which borrows the earlier film’s structure to investigate sites of American institutional violence, from Iraq to New Orleans. More info at France Los Angeles Exchange.